This page has been incredibly helpful to me already as I’m looking into ordering a cake for my parents 30th anniversary in July while we’re there. I wasn’t even sure how possible it would be to manage but now I know it will be and I have the numbers so thank you! I was hoping though to get your opinion on a Disney ordered cake vs a grocery store ordered cake. Ideally I’d like a yummy (obviously haha) chocolate cake possibly with ganache because that’s my moms favorite that says “happy anniversary John and Kathy” I was leaning towards a Disney cake because it would be easier to get it to our room and almost definitely fresher but a grocery store cake would be much cheaper and as there’s a Perkins right off property I could get there to get a cake without too much difficulty I would imagine. What would you think would be the best? Thanks! Disney’s custom cakes are a cut above supermarket cakes (Disney’s pre-made “podium cakes,” not so much…). If it were me, I’d pay a little more for the ease of having a delicious cake delivered right to my room so I had more time free to explore the parks! You can always work with the pastry team on tweaks that will bring the price down (ganache is cheaper than fondant, for example). Also, their size guidelines are really outta whack—you can almost always get away with the next size down from what they suggest for your group size. So for 13 which size would you think would work best? Thanks for the quick reply! Ill probably call them soon and try and get some prices and whatnot. Our trip isn’t till July 14th so I figure I have a couple weeks to decide. Definitely an 8-inch, or you could do the Mickey head cake, which feeds that many and is covered in chocolate ganache! I was hoping to get one with writing on it but I’m definitely going to look into that. Thanks so much! You’ve made this way less stressful haha. That’s fantastic! I’m so glad to hear it! The name of the park is Magic Kingdom and the restaurante “The Crystlas Palace Restaurants. None of their phones are staffed. I do need an assistant. You need to place your order with Private Dining at the Contemporary Resort. Call the resort’s main phone number—1-407-824-1000—and ask to be transferred to Private Dining. PD may try to transfer you to their cake-order voicemail, but let them know that you need the cake ASAP (note that they do need 48 hours’ notice). I’m trying to order a birthday cake and I have to talk to an assistant not the answering machine, please!!! My twin-grandchildren are already at Disney and they’re going to celebrate their birthda on June 11. The “machine” doesn’t give all the information that I do need. Pls, give me phone number by which I’ll be able to place the order. Thanks. Hi Ester! I do not work for Disney. The phone numbers provided on the following page are the only ones I have: https://disneytravelbabble.com/how-to/order-cake/by-location/. Look up the name of the park or the resort where you want the cake delivered and call that number. Unfortunately, most of these lines aren’t staffed all the time, so you may need to leave a message. Hope it works out for you! I ordered a cake for my daughter’s 21st birthday. I sent a photo of her when she was young and dressed as Pocahontas and a photo of a cake I saw on line. They took the photo of my daughter and made it into a topper for a beautiful cake decorated in a Pocahontas theme. Thank you Disney Bakeries for making such a lovely cake for our special event. I’m so glad to hear you had a great experience! I am staying at the Caribbean resorts in 2 weeks and am looking to get a birthday cake for a friend. If I call the hotline, would I be able to get a cake delivered to my room at the Caribbean? Or would I need to pick it up somewhere? Because there’s no Private Dining at Caribbean Beach, room delivery might not be an option. However, I had a cake delivered to me at a Value Resort once, which also doesn’t have Private Dining, so perhaps they use Bell Services at those resorts. Your best bet is to call the number listed for Caribbean Beach on THIS PAGE and talk to them about what your options are. The very easiest thing to do would be to request a chocolate or vanilla Celebration Cake when you check in for your reservation. These cost $21 and are 6 inches, which means they feed 5 or more people. Your server will deliver it at the end of the meal, usually with candles in it. They can’t personalize the cake, but they can usually write on the plate it comes on. If you want a different size, different flavors, or fancy fondant decorations, you’ll need to call Private Dining at the Contemporary to place your order at least 48 hours in advance. The number is on the Cake Options By Location page. Hi, i’m planning to order a cake for my husband’s bday as a surprise when we visit Magic Kingdom – Be Our Guest restaurant. When I order the cake in advance, do i pay it over the phone at the time or order? 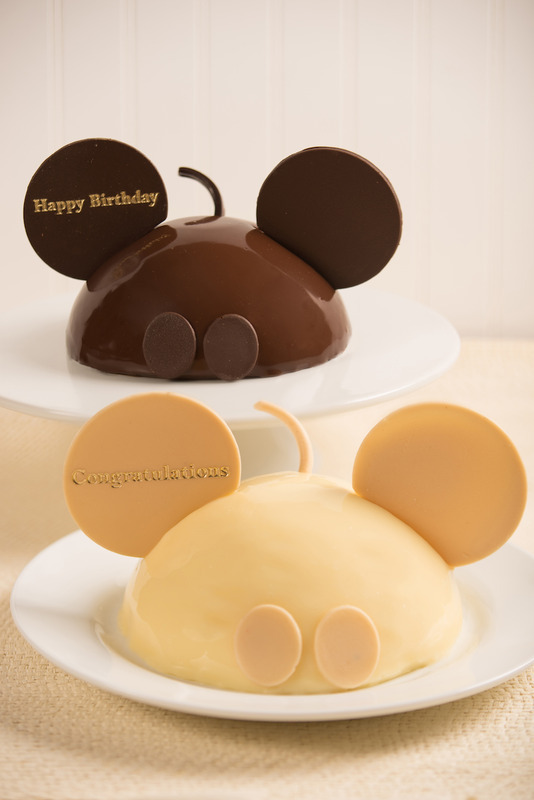 Which cake would you recommend …vanilla cake w/vanilla buttercream or the Mickey Mouse cake? which one taste better? Do they also provide candle when bringing out the cake? How would they know when to bring out the cake? Usually at restaurants they charge you with the rest of your meal, though they may take a card number just to have when you place the order. I’ve never tried the Mickey cake, but people rave about it. It might be a little more interesting than the vanilla cake. They can bring candles; they usually bring the cake at the end of the meal, but it’s always a good idea to remind them you’re expecting one (and you could request candles then too). Coral & shells could set you back about $40, the mini castle cake is around $30, and a 6-inch basic cake starts at $21 (very basic) or about $50 for buttercream with custom decorations. The 6-inch cake will be the largest and can feed 6 or more people. 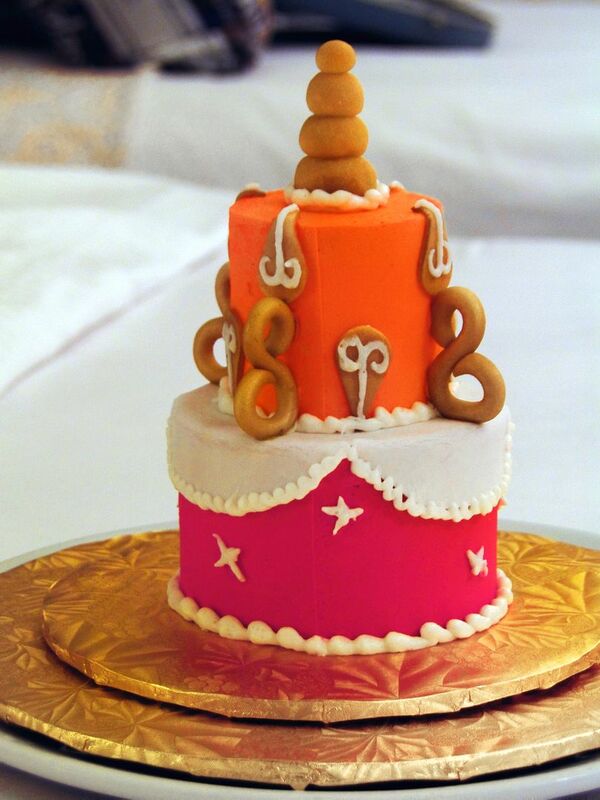 If you get the Coral & Shells cake as a 2-tier mini it will be two big pieces or 3 smaller pieces. One-tier mini cakes like the castle cake make 2 average-size pieces. I think a very basic 6-inch cake will give you the best price-to-size ratio, but I prefer mini cakes (even at their higher prices) because we waste less. My husband & I will be celebrating our 30th wedding anniversay at WDW. Can I order a mini wedding cake for our dessert the night of our anniversay? We will be dining at “Be Our Guest” in Magic Kingdom? Right now, it is not possible to get a custom cake delivered to Be Our Guest for some reason. You could do a “podium cake” (6 inches, all-chocolate or all-vanilla, no customization) or you could do what we did: order a cake to be delivered to our resort room after we got back from Be Our Guest! Yes to all three questions! It doesn’t happen a lot, but they do sometimes screw up. I usually call again a few days before to double-check the order, and I mention it at check-in and to my server when we sit down, just to be sure. Hi Carrie! 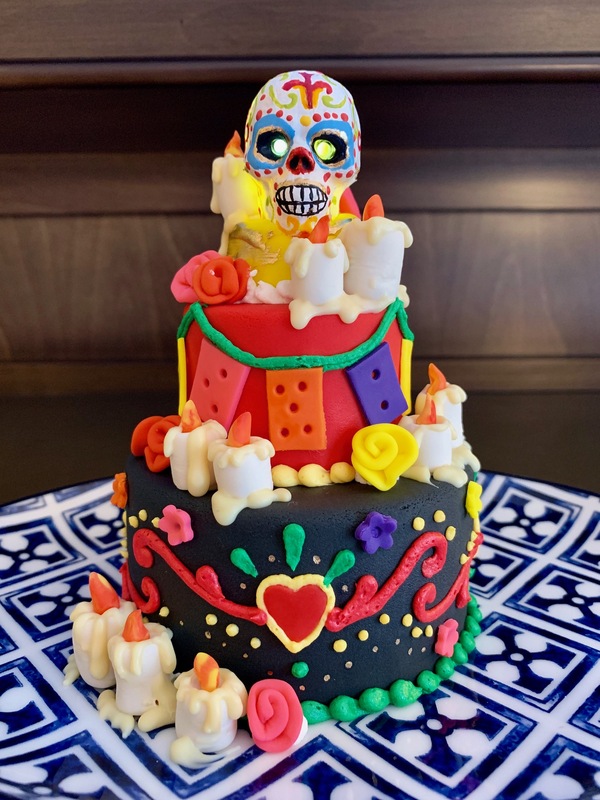 To order a custom cake to be delivered at a park restaurant or resort restaurant, do I have to be staying at a Disney hotel or does it matter if I stay off-site? I assume for a podium cake, it doesn’t matter. Although you don’t know it, you’ve been an immense help to me through your trip reports! Thank you for that! So glad I could help! You don’t have to be staying at a Disney resort to order a cake for restaurant delivery. Oooh! Do you have a trip report anywhere? No, I don’t have a trip report. I was there for three months March-June 2012. I have LOTS of photos of the trip on facebook. If you like, feel free to send me a friend request and view them. There are 7 albums of the trip (insane, I know!) Tokyo Part 1, 2, and 3; Tokyo Disneyland, Tokyo DisneySea, Tokyo SkyTree, and Hanami (Cherry Blossom Viewing.) The good thing is that if you only want to see the Disney photos, they are in their own separate albums. We went when all of the Easter decorations were up so it was really pretty. Of course! Let me know what you think in comments or messages! I was not a fan of the most recent cake I got at Disneyland. It wasn’t bad, just different from WDW cakes in a way I didn’t like. The frosting was more whipped cream-like than buttercream like, and I thought the red velvet cake lacked flavor. On the other hand, Disneyland brides rave about their wedding cakes, so maybe it’s just my weird palate… If I were made of money, I’d have Susiecakes in Newport Beach deliver to my Disney hotel, but their fee is $40+. 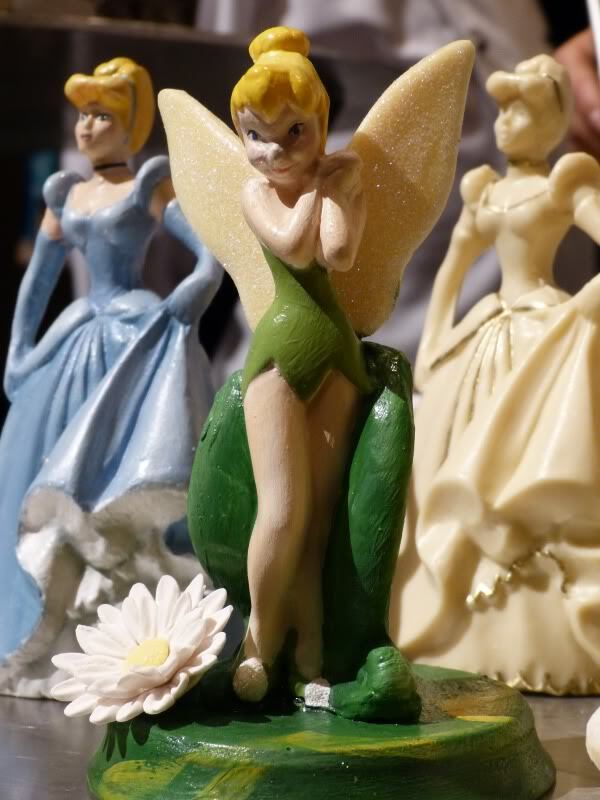 Also… just got a recommendation for Cinderella Cakes in Costa Mesa from Disney Food Blog correspondent Heather Sievers. Thanks, Carrie. So, do I just need to call the Epcot bakery and leave a voicemail with my order? Then, they’ll deliver the cake to Akershus? Will I get some kind of confirmation that they have my order? Also, we only have a party of 5. I see that if I order the 6 inch cake, I cannot get it personalized with her name. I am considering ordering the 8 inch cake just to get it personalized with her name. Do you know what kind of character screen prints they offer for the 8 inch cake? She likes the Disney princesses and fairies. She also likes Minnie Mouse. You could leave a voicemail, but I’m the type who phones til I get ahold of someone. They will deliver the cake to Akershus—just remind your server that you’ve ordered one so they can bring it out. When you talk to someone, they’ll be able to tell you which screen print designs are available; all of those sound like good candidates. Also, if the 6-inch really is a better fit for you guys, you can ask the server to write your daughter’s name on the plate. Hope this helps! Hello. We will be celebrating my daughter’s 5th birthday at Disney World at the end of this month (January). My dad made reservations at the Akershus Royal Banquet Hall at Epcot. What are my options for ordering a birthday cake? Can I call Akershus directly or do I need to order it through Epcot Bakery and pick it up myself? If I need to call Akershus, how do I find the number to call? I’m trying to figure this out on my own looking at various sites and blogs and am getting so confused. Also, what cake options do we have at Akershus? Thanks in advance for your help! Hi Kathleen! This page answers all your questions! Scroll down to Epcot. Akershus is one of the restaurants serviced by Epcot’s bakery, so all the info you need is in the first couple paragraphs under the Epcot phone number. Yeah, you’ve hit the nail on the head. You have a better chance of getting a fancy cake like you imagine it at the GF. They are just more experienced with the whole process. I did see a decent-looking fondant cake from AKL the other day, but it just seems like it’s such a crapshoot whether you’ll get through to someone who can help you and that they’ll understand what you want. Prices may be slightly higher at GF, but AKL ain’t cheap. Flavor options will be greater at GF (if you’re insistent—they usually don’t offer many right out of the gate). Hope this helps… and I’d love to see how it turns out! There are no delivery fees. They do charge tax, and if you have Tables In Wonderland and want to use the discount on the cake, you’ll have to pay the automatic 18% gratuity on the price of the cake. You could get a mini cake version of our anniversary/wedding cake like this one! It only cost us $40ish from BoardWalk Inn, but I wouldn’t be surprised if the Grand Floridian charged $50 or more. Okay, so I called Pat Anderson on a Monday and it took her until 4:30 the next Saturday to call me back….which is the last hour of her workweek! Hmm…I was told that I could only get chocolate or vanilla cake (we wanted almond and settled for vanilla) and given about 5-6 filling options (we wanted amarretto mousse but had to settle for white chocolate mousse with strawberries….I even had to push a bit to get the strawberries). Price for an 8″ cake, about $160 plus 18% gratuity because it was delivered to the Tea Room (service there wasn’t too great, either) The colors, instead of being the rich, bright colors you would expect on an Indian inspired cake, were the bland ivy green and pale pink that is most often seen on old ladies’ floral couches. The cake was too sweet and chemically tasting, like what you would get from WalMart. I’ve never had worse white chocolate mousse in my life, honestly. More than half of the cake went into the trash….we only ate what we did because it was our anniversary and we were DETERMINED to eat it, and our family was nice enough to follow suit. I’m glad that I didn’t get a 2 tier cake since it was so dissappointing as it was (starts at $350 to put a few lollipop sticks into the cake and drop a 4″ tier on top!). I’ve had a week to go over it in my mind, and yes, I am still shocked that the GF would put out something so…bad. Sigh. Win some, lose some, right? Dang! Sorry to hear you had such a bad experience. If you’re up to it, it would be super-helpful if you posted this review (and maybe some photos) on the DIS Boards’ cake thread to share your experience with others trying to decide which bakery to use for cakes at Disney. You might also consider calling Pat back and letting her know what you thought. $160 is outrageous for an 8-inch cake that tastes good, let alone a bad one! I actually just did my first Mickey cake for a 4 year last week. It was tons of fun to do. I really like shell mini cake think I’m going to give that a try. When and how should I order a Mickey Mouse cake to be delivered to our room at the Grand Floridian while we are at the parks ( a surprise for my husbands birthday). We arrive December 15 and his birthday is Dec 17. I would like the cake to be in the room when we return in the evening of the 17th. Should I go through the cake hotline or the Grand Floridian’s Private Dining number. Can you please confirm the number for GF Private Dining. I have seen (407) 824-1951 and (407) 824-2474.. Will they provide plates and forks if I request them? All of those numbers go to the same place. The Cake Hotline will get you to Private Dining eventually, it just takes more button-pushing. The two numbers you have both go directly to Private Dining, but 1951 goes directly to the woman you need to speak to for placing the order. When you order a cake for delivery, they bring plates and forks with it. I read many of the great posts on this site and was wondering what to do. Going to Disneyworld next week and my wife’s birthday is on one of the days while we are in Disney with the three kids. Planning to order a nice cake for that day, but was wondering what would be a better choice: ordering the cake and have them delivered to Coronado where we’ll stay or have them bring it after our meal in Chef Mickey restaurant? What do you think? We have a dining plan with desserts already, not sure if I can substitute the desserts for a cake. Probably not. Thnx! Hi! If you want a fancy cake with fondant over the buttercream, I’d recommend ordering it for Chef Mickey. Coronado Springs is not part of the Disney cake network; they make their own cakes, and the options are quite limited. They aren’t bad cakes, though, so if it’s easier to have the cake delivered to the room, go through Coronado. If you do get the cake at Chef Mickey’s you can’t pay for it with dining plan credits, so be prepared to have lots of dessert. We will be celebrating my daughters 21st birthday at WDW resort in December, she is a huge stitch fan. Is the white chocolate stitch available at the contemporary resort, or do they have some variation for a cake. Btw she does not want LILO on there at all! When I got him, the white chocolate Stitch was only available at the Grand Floridian, but the Contemporary may also have access to the mold. When you call Private Dining to place an order, ask for the pastry chef’s email so you can ask him about this and to discuss the designs on the cake so you don’t get Lilo on there too! does anybody have any idea if Disney will use Splenda in any of their cakes? If it is requested…baby shower needs a mostly sugar free cake and i’m not sure if there are options? They have a standard “allergen-free” cake, but it’s got sugar in it. Your best bet is to use the Cake Options By Location info to get the phone number for the place that will be making your cake, then call and talk to someone directly about your requirements. Would you recommend ordering a cake from the boardwalk and picking it up or having one at our meal at the grand Floridian? I am wanting an 8 inch cake decorated and a mini 2 tier cake. I know both are possible but just wondering if one place is better. Thanks! The Grand Floridian has the most resources and does the largest number of fancy cakes, so it would be a lot easier to order from there and have these delivered to a meal there. The caveat is that the Private Dining contact at the GF can be difficult to communicate with and has been known to get order requests wrong. I mean, this can happen with any of the bakeries, but I’ve just seen a larger number of complaints recently. Purely anecdotal, though…. Disney cake service did a great job on my Grandmothers 98th Birthday Cake. It was not only beautiful to look at but it was one of the best tasing cakes we have ever had. Thank you Disney Cake People!!!! Glad to hear you had a great experience! A friend of our has always sent us cakes whenever to go to Disney (which is a lot, we’re florida residents)..and they are always amazing, delicious, big and perfect…we have had them with strawberries (all over the place), chocolate, vanilla, mini cakes….they really are wonderful, anything you want just call them and ask for it…good luck…and enjoy…you will never, ever taste a cake like that again…. Hi! I am taking my Mom to the Afternoon Tea in the Garden Lounge at the Grand Floridian during our seperate overlaping trips this December, for her birthday! The day we are going happens to be her actual birthday and she is turning 65, so I want to do something special for her to surprise her. I was orginial thinking of ordering the chocolate slipper but now I am thinking a Mini-castle Cake might be better but I am still not sure. Could you give me an apromixate price range for both? Also do the Mini-cakes come in flavor? Thank you in advance! Hi! The slipper costs a little more at the GF than at Cinderella’s Royal Table… I want to say $20, and I know it’s no more than $25. The mini castle cake is about $30, and it comes in vanilla with white chocolate mousse, chocolate with dark chocolate mousse or cheesecake. Have fun! I have decided the slipper would be better this time! When should I ordered it and how?? OK, I got it! Call 407-938-3686 for Art of Animation’s cake line. They said the cast member at that line usually works til 4:30pm ET. Hi – just getting back from a great birthday vacation at Disney World. 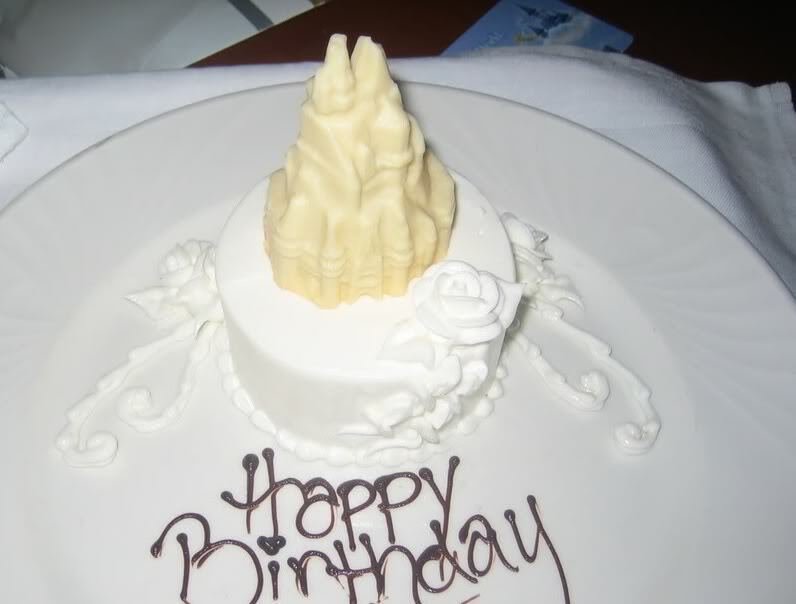 One of my surprises was a beautiful Belle cake, one of the white chocolate solid statues, at the Grand Floridian. I am home now, brought it with me (the statue, not the cake!). Was wondering what thoughts are on preserving this statue. What do you think? Thanks in advance! What a great surprise! What Disney usually tells brides who want to preserve their white chocolate cake toppers is just to keep them in a cool (not cold, and not a refrigerator) dry place. Shellac or fixative is a bad idea, apparently. I’d probably put it in a dome just to keep ants out. But as long as the temperature remains consistent, Belle should last quite a while. Hi. I have ADR at CRT for my daughter’s birthday celebration. There will only be 4 adults and 1 child so we only need a small cake. I love the mini cake with a chocolate castle on top. Do I call the main hotline-will they do this type of cake there? Also, have ADR at Teppan Edo. Would like a screen print of Woody on a small cake that night. What is the smallest size you can do that? Again, only 5 of us and not big cake eaters. Thanks! Hi Dawn! Unfortunately, the mini castle cake is only available at restaurants serviced by the Grand Floridian Bakery; CRT is serviced by the Contemporary Bakery. However, I got a nice non-castle mini cake from them once, so maybe they could work with you on something just as good. Teppan Edo is serviced by an outside vendor. They can do a 6-inch cake in any combo of chocolate or vanilla, but in general the smallest cake you can get a screen print on is 8 inches. I’d call and ask, though, just in case: 407-827-8773. Do you know if Art of Animation will allow room delivery for cakes the same as Pop Century? I know they are pretty close to each other and I wanted to have one delivered to our room for my husbands birthday in October. If that’s not possible would I be able to pick it up from Pop Century if I was staying at Art of Animation? Thanks! I am looking into this for you. Right now they don’t even have all the phone lines connected, so I had to get somebody to call somebody else and leave a message. I’ll let you know what I find out! Thank you so much! I hope they are able to have them delivered the same as Pop. Just wanted to follow up here, too: The number to call at Art of Animation is 407-938-3686. So if I wanted to have a cake delivered to AoA I would call that number? I am considering ordering a cake for my daughter’s birthday. Either delivered to our room at Beach Club Villas that day we arrive. Or cake during tea at Garden View Tea Room the next day. Can I use Tables in Wonderland card to get discount on the cake? If you have the cake delivered to a restaurant, yes. Just be aware that they will also include the automatic 18% gratuity on the price of the cake if you use TIW, which could be substantial if it’s a pricey cake. Technically you can ask a manager to remove/reduce the gratuity, so if I were gutsy enough I’d have them take it off and just tip the server on the price of the meal. Hi I wanna order a cake for 15 people ON Aug 8 for my girls 10th b day! were having dinner at planet hollywood can i get a cake delivered there??? or were staying at the music resort if I can pick it up at the food court before dinner that would be great but im having such a hard time ordering every time i call no answer I have left message after message with no return call ..This getting ridiculos im ready to just give up and when Im there pay a taxi to get to walmart or any near bakery to buy her a cake and while im there pick up snacks and food to save money!! The taxi idea may be your best bet. Disney doesn’t deliver to Planet Hollywood (though you can call the restaurant directly at 407-827-7827 to see if they have their own cake option), and it can be difficult to get a cake delivered to a Value Resort. One thing you might try is calling the operator at All-Star Music and asking them to connect you with someone in the food & beverage department who can help you. The person at that direct number may be on vacation or something. Hope this helps! When I call the cake hotline and go to the Magic Kingdom Selection all you can do is leave information and your email???? Yes, I did this. 2 days ago. Also, they give out an email now magickingdomcakes@disney.com. And you can email all your info (including the restaurant and reservation number). Yes, I did this 2 days ago! They say they will email you an order form the next day. I’ve not received anything. Now, I need the cake for Friday of next week, and the phone line says that you have to order at least 72 hours in advance. Well, that’s Monday and we are travelling on Monday so I will not have any access to a computer. What do I do?? I sent another email today. The Contemporary makes cakes for the Magic Kingdom, and they answer their phone. Call Private Dining at 1-407-824-2955. Good luck! Thanks for all the fantastic info. on cake options around WDW – very helpful! I understand I can order a cake (from the Boardwalk Bakery) to be delivered to Saratoga Springs but do you know whether we’ll be able to eat it in the bar area? We’ll need plates and cutlery, so will need the co-operation of the hotel staff, but I can’t find an email address or telephone number on which to contact them! So….please can I simply (eventually!) ask whether you’ve ever heard of guests eating their cake in a hotel bar area rather than in a restaurant or a hotel room?! Hi Deb! I don’t see why that would be a problem at all. Just call the number for Saratoga Springs (*not* BoardWalk Bakery) on my Cake Options By Location Page and tell them you want to order a cake for delivery to the Turf Club. Happy planning! We are having our wedding night dinner (just the two of use) at Epcot’s LeCellar. We would like to order order a 2 layer cake and have our own Disney (Lenox) topper put on the cake and delivered to Le Cellar. Is this possible? You might need to put the topper on yourself or give it to your server to to place on the cake for you, but you should be able to order a 2-tier cake from Yacht & Beach Club Bakery for delivery to Le Cellier. Contact info is here: https://disneytravelbabble.com/how-to/order-cake/by-location/#ybc Congratulations! I am taking my son to Disney for his 5th birthday in June, we are very excited. I have reservations @ Sanaa to celebrate his day. I want a special cake that he will always remember. I have seen both great & not so great pics & stories on the net. What is my best bet for having a super awesome cake delivered to Sanaa? Do you have any suggestions for a graduation cake for my daughter. We will be staying at Fort Wilderness Cabins. Will they put the cake in our cabin? That’s a tough one because there’s no room service at Fort Wilderness. They will probably have you pick it up at Trail’s End, but it’s definitely worth asking about when you call. As for inspiration, I always search http://www.flickr.com using the terms I’m thinking of (e.g., “graduation” and “cake”) and usually turn up some pretty nifty cakes people have made! We are planning a trip this August for my daughters high school graduation. We are staying at The Grand Floridian. I see you mentioned no Winnie the Pooh characters on cakes… Why is that?? My daughters favorite character is Tigger – does this mean I cannot get her any kind of Tigger cake? Disney does not own the Pooh characters, they are only licensed from the author’s family. I have been told by several Disney pastry chefs that this prevents them from including Pooh characters on cakes. However, someone on the DIS boards recently got a cake with a Pooh screen print at Epcot, I think probably because that chef was unaware of the ban. So it doesn’t hurt to ask about it and see what they say. The only thing is, if anyone is going to be up on company policy, it’s the Grand Floridian bakery, so you may need to try calling around Disney til you find a location that will make you a Tigger cake. Is it possible to make a no sugar added cake? Possible just the cake itself? The icing? Or the whole cake? I’ve called the cake hotline and was told that a chef would call in 48 hours to answer this question. Well its passed the 48 hours. 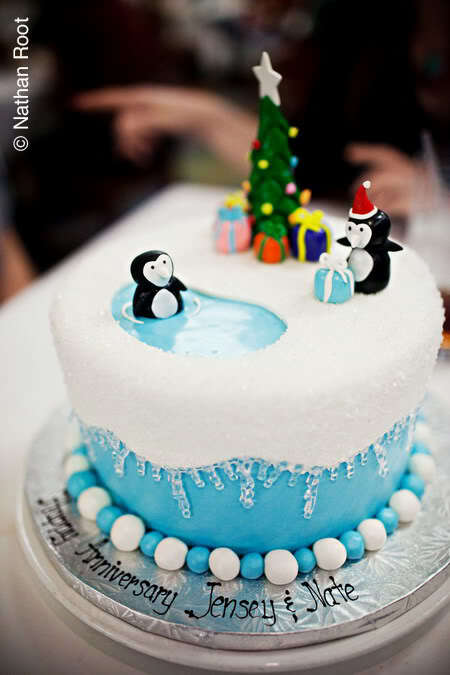 I would like to have this cake at the restaurant Sanaa. I think the best thing to do is to speak with the chef directly, so let me see if I can point you in the right direction. This is the direct number for Private Dining at Animal Kingdom: 407-938-4720. I’m also going to email you the most recent email address I have for the pastry chef at AKL. Hopefully she’s still there! My husband and I got married at the Polynesian Resort 5 years ago this week. Is there any way that I can order a small wedding cake like the one we had at our wedding to be shipped to us? Unfortunately, Disney doesn’t ship food. What I would suggest is contacting a local bakery about making a re-creation based on your photos. You’ll probably have more flavor choices and pay less that way, too. Happy anniversary! Your site is very helpful! Since an actual Disney World wedding is way too expensive for our wedding budget, we are getting married at Shades of Green, the military resort on Walt Disney World property. Will they make me a wedding cake even if I am not having an “official” Disney wedding?? Congratulations! Disney’s bakeries don’t care where you get married. 🙂 Anyone can call the numbers listed in this tutorial to order a cake—the only requirements are that you stay or dine at a Disney resort. Now I have noticed that certain CMs have been more receptive to my requests for a custom cake when I mention it is for a wedding/anniversary, so you might want to mention it just for that. But it still doesn’t matter what kind of wedding you’re having. How do you get the Cake Hotline people to actually answer their phone? I am going to Disney World 3/11/12 and have been trying to order a cake for over two weeks now. We are going to dine at Boatwright’s Dining Hall at Port Orleans Riverside. I always get a message that says “extension… is not available.” When I leave a message, no one likes to call back. I have had someone call me back twice in the last two weeks. The last time was 5 days ago on a Sunday. The person was supposed to call me back with pricing on Monday 2/27/12 after talking to the baker, but never called back. Like I said, no one ever answers the phone. I’ve tried calling all times of the day and night! I’m so frustrated. If my granddaughter (who will be turning 5) doesn’t get her cake, I’ll be SO disappointed! Wow, that really is frustrating! OK, I’d try two things: 1) If the number you are using is the one in my tutorial, try calling the main Cake Hotline and following the prompts for POR just to see if the system takes you someplace different. 2) Call the main number for POR — (407) 934-5777 — and explain to them your situation. Tell them you’ve already been in touch with someone at Boatwright’s (or in the dining office or whatever department there manages food service) but that you are having trouble getting through, and your trip is coming up soon. Ask if they know of another number you should be calling or a better way to get in touch. If the person you’re speaking to does not seem too interested in helping you, wait a bit and call back. Can I get a mini-castle cake if I am staying at Disney’s Port Orleans Resort-French Quarter? Can I have the outside frosting in pink instead of white? Or, at least have the rose in pink instead of white? Also, we will be dining (we have ADR) at Boatwright’s Dining Hall at Port Orleans Riverside for my granddaughter’s 5th birthday and would like the cake delivered to the restaurant so it will be a complete surprise to my granddaughter. Is that possible or do we have to pick up the cake (or have delivered to our room)? Unfortunately, the mini castle cake is only available at restaurants at the Grand Floridian. If you do decide to dine there, you would order by calling Private Dining at 407-824-1951; they can tell you what the options for customization are. Complete information about ordering a cake to be delivered to Port Orleans Resort is available here: https://disneytravelbabble.com/how-to/order-cake/by-location/#por. When you place your order with POR, they can arrange to have the cake delivered to you at Boatwright’s. Hi ! I am having a Luncheon Baby Shower at the Tea Room at the Grand Floridian. And I am thinking what kind of cake I would like. Your information was great. I was thinking of maybe cupcakes??? Cupcakes are in right now and was wondering will they do them for me? Definitely talk to Private Dining (407-824-2474) about this to see what they say. Sometimes they can be a bit… inflexible in what they offer, and other times they bend over backwards to do a custom order. I have never seen cupcakes except at catered events, but that doesn’t mean they don’t offer them. Also, you should know that the Garden View Tea Room prohibits opening of presents or playing games—they may already have told you this, but I wanted to be sure you knew because it’s kind of unusual and might put a damper on a traditional baby shower. My husband and I went to our first Disney wedding at the Grand floridian on Sept.the 3rd and it was the best cake i ever ate in my life!!!!!!!!! I would love to order my self one the same favor but smaller it was a yellow cake i think the filling was vanilla.Please let me know how to order one to new york thank you very much. Sorry, another question. Can I ask for a box as well, so leftovers can be put in the fridge? The cake comes in a box. Private Dining will remove it and display the cake, but the box should be stashed somewhere nearby. Although, come to think of it, the mini cake I got came on a plate and wasn’t in a box…. just to be sure, have Pat put a note in that you want to keep the box. We’re staying at Grand Floridian, and would like to order a cake. Do we have to be in the room when the cake is delivered? I was hoping that it could be a surprise on the second day of our arrival. Hey I was wondering how far in advance you usually call the hotline? Also do you happen to know the phone number for private dining at the Grand Floridian? It’s best to call no earlier than 2 weeks ahead and no later than 2 days ahead. The number for Private Dining at the Grand Floridian is 407-824-2474. Is there any way of me getting a chocolate cake with vanilla frosting for my daughter’s birthday at the Castle ? Yes! Just call the Cake Hotline and follow the prompts for the Magic Kingdom and Cinderella’s Royal Table. If they are only able to do chocolate cake with chocolate frosting, call the Contemporary Resort (407-824-1000) and ask for Private Dining. Tell them you want to order a special occasion cake from Chef Brian to be delivered to Cinderella’s Royal Table.